Dr. Manvir Bhatia�is the director of the Neurology and Sleep Centre, a senior consultant Neurologist and Sleep Specialist, and is also currently Visiting Senior Consultant in Neurology and Sleep medicine at Medanta- the Medicity, Gurgaon. Her previous roles include Addl. Prof Neurology, AIIMS and Chairperson of Dept. of Sleep Medicine at Sir Ganga Ram Hospital, New Delhi.She has been a pioneer in creating awareness about Sleep Disorders and establishing the role of Sleep Medicine in the country.After completing her DM in Neurology in 1993, at the All India Institute of Medical Sciences, New Delhi, she continued as a faculty member in the Department of Neurology, and was given charge of the Clinical Neurophysiology Lab. She attended training courses and workshops in USA & England in Electrophysiology, Epilepsy and Sleep Medicine. 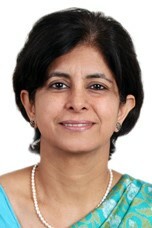 Following this, Dr. Manvir Bhatia integrated the knowledge to initiate the Epilepsy Surgery Programme at AIIMS, other important developments included starting the FIRST sleep clinic and sleep laboratory and developed the ‘state-of art’ Clinical Neurophysiology Laboratory under the Neurology services at AIIMS. Dr. Manvir Bhatia has been invited to deliver lectures in National & International workshops, conferences. Has participated in live shows on TV, published articles in magazines and newspapers on topics related to Neurology, Epilepsy, and Sleep Medicine. She was invited by the WHO to participate in developing guidelines for health issues related to SLEEP DISORDERS. She is a member of the American Academy of Sleep medicine, World Association of Sleep Medicine, Indian Society for Sleep Research, Indian Academy of Neurology ,Indian Sleep Disorders Association etc.